It is the belief of a few Beatle experts that this was a very limited Monarch Records' pressing (MR machine stamped in deadwax) for a selectfew West Coast local DJs to test the reception of the next possible VJ single. 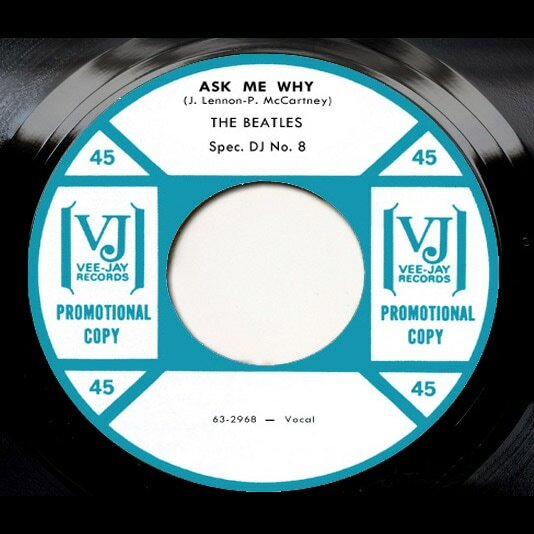 In order to continue to promote the Introducing the Beatles album, Vee Jay issued promo copies of an Ask Me Why/Anna single, although no copies were ever commercially released. The matrix information indicates that these singles were made before the matrices for the upcoming "Twist and Shout" single. In fact, Bruce Spizer reports that Vee Jay documentation indicates that Vee Jay was testing the waters for potential Vee Jay singles. They considered "Anna" to be a potential single, and by March, 1964, it was issued a tentative number, VJ 586. That number was never used. Alternatively, they released VJ 587 (Do You Want to Know A Secret/Thank You Girl) and moved these two songs to their only EP release, Souvenir Of Their Visit To America. Both the EP and VJ 587 single were released on the same day, March 23, 1964. It is rumored that only between 4 and 6 copies exist today, making this the rarest Beatles' single in the World!